Security Forces Struggle to Deal Effectively with Delinquents at the Estadio Olímpico de la UCV, 14 December 2014 (Líder en Deportes’ Youtube Channel). In circumstances as unsavoury as they were absurd, Trujillanos lifted their first-ever domestic title despite playing little more than 50 minutes of what was supposed to be their triumphant final win of Venezuela’s Torneo Apertura. 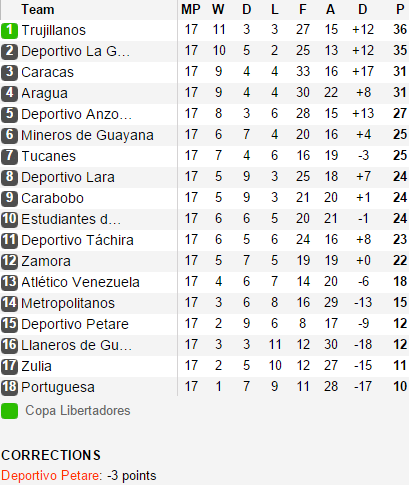 While two clubs based in the nation’s capital, Deportivo La Guaira and, to a lesser extent, Caracas FC, went into the final weekend with some residual hopes of prizing the trophy away from Los Guerreros de la Montaña, the leaders never looked like faltering at the final hurdle. They took an early lead against another side from Caracas, Deportivo Petare, courtesy of a low 30-yard strike from Johan Osorio that skidded into the bottom corner and then midway through the first half, the Colombian forward James Cabezas – the club’s top-scorer in the league – headed them into a two-goal lead. Just after the restart, their position seemed so assured that midfielder Argenis Gómez felt it was the time and the place to attempt a Panenka-style chipped penalty. However, while this rebounded back off the crossbar there was little chance of his minor act of insouciance rebounding back in his face as shortly afterwards, the game was abruptly halted. Attention was instead compelled to turn to the actions of a group of 10-15 hooded male youths seemingly ranging in age from teenagers to those in their early twenties, whose presence outside the Estadio Olímpico de la UCV had been noted on social networks before the game. Spectators inside the dilapitated stadium and at home watched on as, from behind the rusty perimeter fencing at the end that separates the ground from the streets, this ostensibly unaffiliated mob began hurling abuse as well as throwing stones and bottles. As there was a large space – not to mention, in common with most other multi-purpose grounds in the league, an athletics track – between them and the fans, no-one is believed to have been hurt but their persistent threats of intimidation required the security forces to take action. Consequently, pellets were shot and tear gas was sprayed, the latter of which caused several of the patient players on the field to shield their faces by either covering them with their shirts or laying prostrate on the pitch. Scenes befitting of impending champions, these were not. Forty minutes passed and every other team in the league had completed their season apart from the presumed heirs to the throne and their beleaguered hosts. Ultimately, the inability of the security forces to deal effectively with the situation was deemed to be due to Petare’s understaffing and lack of available provisions. Consequently, with the safety of those inside the ground not guaranteed, the match, as well as the season, was concluded. Officially, the game was awarded to Trujillanos as a 3-0 victory but the outpouring of any euphoria that events had not managed to drain from their players was further stalled, as on security grounds, they were hastily ushered back into changing room. Allegedly, this was partly due to the delinquents voicing their opposition to the side from the north-west city of Valera openly expressing their elation in the capital’s premier football stadium, which is also shared by the team that they are believed to support, Caracas FC. Nevertheless, this did not stop the 100-150 fans of Los Guerreros running onto the pitch in jubilation and mercifully, they were eventually allowed to be joined by some of their players. The exuberance with which the first-ever title win in the club’s 33-year history was celebrated belied any dissatisfaction with how the day’s events unfolded. However, though Trujillanos were not fortunate to be awarded the win and their fans were justifiably proud of their team’s achievement, surely even they would acknowledge that the the manner in which the season unfolded in their favour was as much due to their rivals’ incompetence as much as their own quality. Indeed, the serendipitous aspects of their victory may partly explain why little could tarnish this historic triumph. Perhaps it is an inevitable consequence of a 17-match campaign in which the whims of the fixture list plays a part in determining the final standings, but the title-race during this Torneo Apertura was a very topsy-turvy affair with several teams at times looking like potential champions. One took a commanding early lead only to suffer an appalling run of results, others were initially hindered by engagements outside of the nation’s borders but made gradual progress up the league, some sides hovered in the upper echelons without ever quite making the necessary upgrade and one club that was tipped for glory never even challenged. What then follows below are some relatively accessible reviews of the performances of six leading clubs accompanied by some musings on their chances in the Torneo Clausura. The clubs were chosen as much for their statuses going into the campaign as much as their final positions. The first three of these sides, by virtue of their final positions in the 2013/14 campaign, will play in the 2015 edition of the continent’s leading club competition, the Copa Libertadores. The subsequent three teams all played in 2014’s Copa Sudamericana (the continent’s secondary club competition, which ran from August to December), yet interestingly all finished higher in the Apertura than the three Libertadores-qualifiers. There were, of course, some other teams, such as Aragua and Deportivo Anzoátegui, who finished in higher positions than three of the teams who have been included and who, at times, appeared to be potential dark horses for the title. Their exclusion here is largely down to a combination of not being tipped pre-season and being slightly off-the-pace of the front-runners but nevertheless, they certainly played their part in the Apertura and it would not be a surprise to see them seriously challenge for the Clausura. Before getting onto the reviews, for the uninitiated, here is a brief summary of how the Venezuelan Primera División is structured: 18 teams play each other once in the Torneo Apertura (Opening Tournament) from August to December, then the fixtures are reversed and they do it all over again in the Torneo Clausura (Closing Tournament) from January to May. The team(s) that is/are victorious in each tournament is/are considered to have won a title. If one team wins both then they are crowned the champions outright. However, as is more likely, if the tournaments are won by different teams then these two title-winners face one another in a two-legged play-off in May. There is also a domestic cup competition, the Copa Venezuela, that is played from August to December. Final Standings of the 2014 Venezuelan Torneo Apertura (Soccerway). 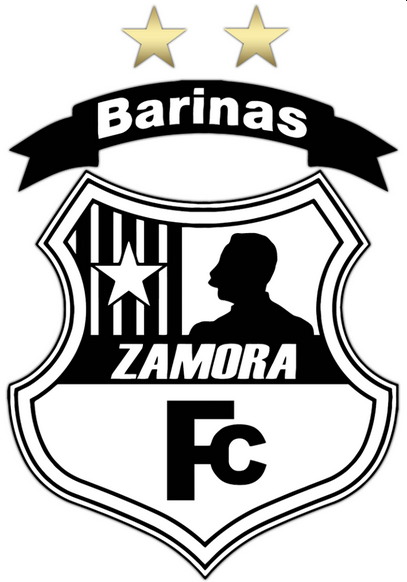 Despite having won the last two championships outright – the only such victories in their history – the recent glory of the side from the late Hugo Chávez’s home state of Barinas was never predicted to continue into the new season. Indeed, as is common in South American football, they were victims of their own success, as their May national victory was rewarded with the departures of some key individuals. On the playing side of things, these included Pedro Ramírez – a jinking midfielder who was dubbed the ‘Venezuelan Messi’ after a mazy, dribbling goal against Carabobo – to Swiss club FC Sion and top-scorer Juan Falcón to FC Metz, where he made a fruitful start, netting four times in his first eight Ligue 1 games. The most keenly felt loss, however, was undoubtedly that of manager Noel Sanvicente who, having won the national championship twice with Zamora and five times with Caracas FC, was deservedly named as the new manager of the Venezuelan national side. ‘El Chita’, as he is affectionately known, was present to be commemorated before his ex-club’s opening game against Deportivo Lara, a mid-table side with the most modern, purpose-built stadium in the league, even if it is regularly less than ten per cent full. However, this match was played at Zamora’s home, Estadio Agustín Tovar, where Sanvicente must have been squirming in his seat as he witnessed his former charges come within seconds of surrendering the then-30-game home undefeated record he had overseen. A dubious penalty in the last minute of stoppage-time won by the brightest remaining prospect Jhon Murillo – who had an unsuccessful trial with Basel in the close season – and converted by the Argentine Javier López ensured the champions saved face with a 1-1 draw. Yet this result only offered momentary salvation as Zamora were to endure a disastrous run of form, not winning any of their first 11 games, seeing their unbeaten home record end after 33 games against – somewhat appropriately – Trujillanos and finding themselves at the very bottom of the table. Sanvicente’s replacement, Juvencio Betancourt, was an early casualty of this meek title defence, losing his job after six games and gaining only four points. The man who stepped into his shoes, Julio Quintero, initially had no greater joy trying to stem the club’s decline and it was actually on his watch that they lost their unbeaten home record. However, this was to be their last defeat of the season as, following a draw with Petare, they went on an impressive and statistically unlikely run of five consecutive 2-1 victories. Two significant scalps along the way came against the two most decorated clubs in the top-flight, Caracas FC and Deportivo Táchira. On the final day of the season, had a red card to midfielder Jhoan Arenas with 15 minutes remaining not put them on the back-foot, they may well have avoided conceding a late equaliser against strugglers Zulia and recorded their sixth straight 2-1 victory. Nevertheless, this 2-2 draw meant they ended the Apertura undefeated in their last seven games, clawing back at least some dignity with a 12th-placed finish. Following the campaign’s climax, Quintero – the beneficiary of a new contract – was quick to make reinforcements and while it remains to be seen whether they can be anything other than fodder in their Libertadores group, they will surely fancy their chances of a top-half finish in the Clausura. Pre-season, the side furthest east of the nation’s north-western footballing heartlands was believed to be in pole position to win the Apertura. 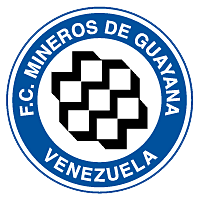 Indeed, Mineros de Guayana were unfortunate to have finished runners-up to Zamora in May’s Gran Final following a 4-3 aggregate loss, having won the 2013 Apertura and collected the most points in the aggregate table. On paper, even with the retirement of former international midfielder Ricardo Páez and the loaning out to Colombian giants Atlético Nacional of current national team box-to-box battler, Alejandro Guerra, there appeared to be little disputing the quality of their squad. After all, they still contributed the most players to the national selección. However, in the internationals played concurrently with the Apertura, these individuals were to become the most consistently criticised performers, particularly experienced left-back Gabriel Cichero, who moved to Mineros pre-season on loan from Swiss side FC Sion after a spell at Nantes. He has played in all four defensively porous games of the Sanvicente era, including the 5-0 hiding served by Chile. In this game, his club team-mates Edgar Jiménez and Rafael Acosta played in front of him as the defensive-midfield pairing whose shortcomings were to be embarrassingly highlighted as they were repeatedly bypassed with ease. Whether their form in the shirts of La Vinotinto was influenced by their club performances or vice versa is difficult to say, but their start to the season was nevertheless far from what was anticipated and ultimately, they were never to come close to challenging for the title. Alarm bells started ringing early on as an unconvincing opening day 1-0 win at home against newly-promoted Metropolitanos was followed up by a 1-1 home draw against another side fresh from the Segunda División, Portuguesa. Their opponents may have had five domestic titles to their name but these were all won back in the 1970s in more prosperous days when they even managed to attract Brazilian legend Jairzinho to the club for one memorable year in 1977. They even took the lead but a Richard Blanco strike 15 minutes from time restored parity for Mineros but disaster was only temporarily averted as, following away draws against first, Aragua and then, on a rain-sodden pitch in a farcical game against Zamora, they were to lose their 32-game home undefeated streak in the league. Where the similarly lengthy run of last season’s champions was ended by this Apertura’s eventual winners, that of last year’s runners-up was halted by the side that were to finish second, Deportivo La Guaira. Another way in which Mineros de Guayana’s campaign was to echo that of Zamora’s occurred a few days after their next game, a 3-1 away defeat to Deportivo Lara. Indeed, also six games into their campaign, Mineros parted ways with their manager yet whereas Juvencio Betancourt’s sacking elicited few mourners, that was certainly not the case for the departure of Richard Páez. Owing mainly to his role in overseeing the national team’s rise on the international stage from 2001-07, he is, without doubt, one of the leading figures in Venezuelan football over the past 10-15 years (if not of all time). Arriving at Mineros in advance of 2013’s Torneo Clausura following stints in Colombia and Peru, not only did he come agonisingly close to providing the club with their first championship in 2013/14 since their solitary triumph in 1988/89 but he left with a win-rate of over 63 per cent. Understandably, many fans were upset at the owners’ apparent impatience with this downturn in results and protested on the pitch at the next game at home to Estudiantes de Mérida. Of their many chants, some were aimed at César Farías, Páez’s successor on the international stage (2008-13) who had recently been sacked by Mexico’s Xolos de Tijuana and since been linked with the Mineros role. Shortly after what turned out to be a 2-0 victory for Mineros, it was to actually be Marcos Mathías, assistant to Farías at Xolos and also the former coach of Venezuela’s Under-17 and Under-20 sides, who took over the reins for the final ten matches of the campaign. Though his points-per-game ratio for the Apertura (16 from 10) was to prove superior to that of Páez (6 from 6), this should not reflect too negatively on the ex-national coach who not only was not given a great deal of time, but also had a difficult job re-invigorating his troops after May’s disappointment. Nevertheless, Mathías ensured the side recovered from the lower-half of the table to finish sixth and though the lack of goals in four of his games must have been a concern, he has already attempted to rectify this ahead of their Clausura and Libertadores campaigns with the signing of James Cabezas. More on this later in the section on Trujillanos. With seven championships to their name, the second-most successful team in Venezuelan history were also predicted to have a strong campaign, with many fancying them as potential runners-up and some even suggesting they were joint-favourites to win the Apertura. However, the difference between Mineros and the club situated high in the northern Andes less than an hour’s drive from the Colombian border was that, for the first half of the season, the latter actually challenged for the title and looked the front-runners to win it. Indeed, the club whose home games were to be witnessed by the highest average attendance in the Apertura got off to a fine start, beating another of the capital’s five top-flight sides, Atlético Venezuela, 3-0 at home on the opening day with striker Gelmin Rivas notching a hat-trick. In terms of goals, the 25-year-old forward was to enjoy the most prosperous calendar year of his career to date and he was to score 7 in his club’s opening 6 games of the Apertura, at which point Táchira led the way, having dropped just 2 points from a possible 18. This was to be the high point for Rivas as he failed to hit the target again, with Deportivo Anzoátegui’s Panamanian international striker Edwin Aguilar ultimately topping the scoring charts with 13 goals. It was also to be Aguilar and co. who ended Táchira’s unbeaten start in the latter’s seventh game with another Panamanian, Rolando Escobar, netting a late winner. However, despite this blip, they were to remain at the helm of the league and followed this game up with a 1-1 home draw against Carabobo – the highest-attended match of the Apertura (15,378), which witnessed arguably the best goal – and then a 3-1 away win against Deportivo Petare. Yet remarkably, despite Táchira’s bright start, this victory in the Estadio Olímpico de la UCV was to be their last one of the campaign. Their next two games were successive defeats away to Mineros de Guayana and then, in a considerable upset in their eleventh game, at home to Metropolitanos, at which point Los Aurinegros were usurped at the top for the first time in the Apertura by Deportivo La Guaira. 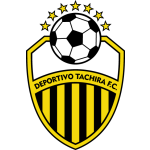 Having accrued 20 points from their first nine games, Táchira gained just 3 from their remaining eight, free-falling from 1st to a final position of 11th. 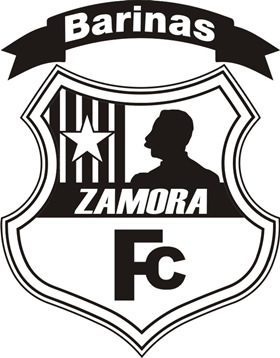 If it helps to further highlight their declining form, when they were riding high at the top nine games in, Zamora were languishing in last with a mere four points, yet managed to salvage their campaign to finish just one point and one place behind Táchira with 22 points in 12th. Somewhat curiously given the knee-jerk responses to adversity at Zamora and Mineros, Táchira’s manager Daniel Farías kept his job, though the relatively youthful 33-year-old doubtless has a considerable job reinvigorating his side ahead of the Torneo Clausura. He has much talent at his disposal, not least towering centre-back Wilker Ángel, an emerging prospect who scored in November against Bolivia on his international debut and has reportedly attracted attention from clubs in Europe and elsewhere in South America. Another key player in the squad is the attacking midfielder Yohandry Orozco, who moved from Zulia to Wolfsburg in January 2011, hot on the heels of scoring a sensational goal for the Under-20 national side that received acclaim from, amongst others, renowned South American football authority, Tim Vickery. He returned to his homeland to Táchira in mid-2013 having made little impact in Germany and though he enjoyed a strong first season back (12 goals in 34 games), a solitary goal in this Apertura was all he could muster as he struggled to regain the form that gained him a reputation as one of the country’s most exciting prospects. It remains to be seen whether Farías can bring the best out of Orozco and his team-mates as well as hold onto Ángel. Unlike Zamora and Mineros, Táchira will have to qualify for the Libertadores Group Stage and with a tough play-off tie against Paraguay’s Cerro Porteño in which the likeliest outcome will involve Táchira having to focus on the league, this may well prove to be a blessing in disguise for Farías. Historically, the country’s most successful side with 11 championship wins, Caracas FC will definitely have more time to focus on the Torneo Clausura. After their commitments in the Copa Sudamericana caused some fixture congestion and international call-ups deprived them of key players at crucial moments in the Torneo Apertura, Eduardo Saragó’s side will surely relish the opportunity to rectify what may be seen as a missed opportunity. Indeed, due to reaching the second round of the Copa Sudamericana, Caracas FC were playing catch-up for two-thirds of their campaign being, at times, two or three games behind their rivals. Yet after blowing an opportunity abroad in late September to face Boca Juniors in the Round of 16, the number of rescheduled matches and inconsistent form of their domestic rivals meant that the league title always appeared to be within their grasp. Their campaign got off to a false start as, with a mere 17 seconds on the clock, Estudiantes de Mérida’s Colombian attacker Over García struck home past Alain Baroja from 30 yards for what proved to be the only goal of the game. This loss was to be the only blemish on Caracas’ record at the Estadio Olímpico de la UCV all season, as they won all of their remaining eight games there, in the process racking up high-scoring victories against Aragua (5-0), Zulia (4-2), Tucanes de Amazonas (5-1) and Portuguesa (5-2). Thus, ultimately it was their away form that let them down: in these eight games, they were to attain only one victory – 2-0 against Deportivo Petare – and even this occurred at the Estadio Olímpico. Nevertheless, with no other team really making a convincing claim for top spot for any sustained period of time, their own title hopes were always alive and never more so following their tenth match of the Apertura on 2 November at home to Carabobo. Within just 18 minutes, the side representing the state that was the site of the decisive 1821 battle that led to the nation’s independence from Spain, were 2-0 up. This was the twelfth game for the visitors and with some impressive results and no defeats to their name, they were beginning to look like viable outsiders for the title. Ricardo Andreutti got Caracas back into the game not long before the break but, well into the second half, Carabobo continued to attack and often looked the more likely to score. That is, until the home side won a penalty with just over 15 minutes remaining that was converted by the well-travelled and much-capped Miguel Mea Vitali who, in the 82nd minute, then knocked in a rebound to complete an exhilarating 3-2 comeback. With this victory, their fans’ pining for glory increased in volume as, following their solitary away win against Petare, their side, with two games in hand, were now on 23 points, hot on the tails of Deportivo La Guaira (25) and Trujillanos (24) – the latter of whom were to be their next opponents. This game at Estadio José Alberto Pérez was billed as potentially having a crucial influence on where the trophy ended up and, on that front, it certainly delivered. The visitors suffered an early setback when James Cabezas gave the hosts an early lead and things went from bad to worse later on in the half when forward Edder Farías got himself sent off for violent conduct. Yet an unlikely point appeared to have been salvaged when Mea Vitali, a defensive-midfielder by trade, was again on hand to level up the score in the 67th minute. However, with what was virtually the last touch of the game deep into stoppage-time, Johan Osorio directed a header into the net to give Trujillanos a vital win that put them in pole position. Reeling from this late blow, Caracas followed this up a week later with another 2-1 loss, this time against a resurgent Zamora, who gained their second consecutive win (as a sidenote, the consolation goal was scored by 17-year-old Leomar Pinto who, earlier in the year, enjoyed a brief stint training with Arsenal). With these two defeats, Los Rojos del Ávila had squandered virtually all of the belief and optimism that had been stockpiled over the preceding two months as they were no longer really playing catch-up, being still in 3rd, but four points behind leaders Trujillanos and with just the one game in hand. However, Caracas may feel a little aggrieved as both of these defeats came at a time in November when they were deprived of some key players due to international duty. The most notable loss was of one Rómulo Otero, a nifty attacking midfielder and free-kick maestro prone to the occasional dribble who has courted much attention abroad for at least the past couple of years or so. Along with full-back Francisco Carabalí, he was in the senior international squad that faced Chile and Bolivia, the latter of whom were on the receiving end of a rifled strike from former Caracas utility man Alexander González (now of Swiss side FC Thun), who was superbly assisted by his former club team-mate Otero. The Trujillanos game was played when both men were with the national set-up and the Zamora match occurred just 24 hours after the Bolivia international – certainly not enough time to return and recover from the altitude of La Paz. By contrast, Trujillanos had no players on senior duty and Franklin Lucena, the sole representative of the other leading title-challengers Deportivo La Guaira, had a four-day wait before his club’s next game against Portuguesa. Thus, he was able to come on as a late substitute in a 1-0 win against what turned out to be the worst team of the Torneo Apertura. It should be noted that Trujillanos and La Guaira did have some other absentees of their own around this time until late November/early December. The former were missing midfielder Carlos Sosa and the latter were without Adalberto Peñaranda, an exciting prospect who, back in February at the age of just 16, scored a phenomenal individual goal that involved running from the edge of his own area, dribbling past six players and firing home. They were both competing with Venezuela’s Under-20 side in Veracruz, Mexico, at the Central American & Caribbean Games, a tournament at which they eventually finished runners-up to the host nation. However, Caracas FC themselves had not one, but two players in this squad themselves: Beycker Velásquez (who, admittedly, as reserve goalkeeper to Alain Baroja, was unlikely to have played even had he not made the trip) and defender Jefre Vargas (who, by contrast, had been a regular starter up until this point). Thus, while the other two title-challengers had some issues with international commitments, Caracas FC were the most adversely affected in this area. Whether things would have been different had they not been encumbered in this way is impossible to say but these two defeats all but ended their title bid, with only a notable slip-up each from their rivals (more on this soon) keeping alive their rather faint hopes until the final day. Looking forward to the Torneo Clausura, Caracas FC may be glad that they are not playing in the Libertadores and are thus less likely to suffer from a domestic fixture pile-up. They should consider themselves amongst the favourites to lift the trophy but in the brief inter-season break have already parted with some players, most notably Argentine defender Roberto Tucker. Their potential challenge for silverware may also be hindered by the potential loss of Jhonder Cádiz, a 19-year-old attacker whose agent has not been shy about claiming is a wanted man abroad. Most importantly, they will need to keep ahold of sought-after golden boy Otero who, at 22 years of age and having already had interest from Grêmio rebuffed by his family, surely can not hold off taking the overseas test for much longer. Of all the sides who had a plausible chance of winning the Torneo Apertura, this well-funded, ambitious ‘new’ club was alone in occupying a position within the top two for virtually all of the campaign. They partially benefited from a lack of interference with their domestic schedule and once September had got under way, the team formerly known as Real Esppor soon became the likeliest challengers to early pace-makers, Deportivo Táchira, eventually usurping them in early October after their eleventh game. Yet despite defeating Trujillanos in the league as well as on penalties in the final of the domestic cup competition, they were ultimately to be denied a domestic double, surprisingly dropping points in the penultimate round in a game in which they were firm favourites. Nevertheless, though this was a very dispiriting finale, the achievements of Leonardo González’s men in the second half of 2014 should provide them with considerable optimism going into 2015’s Clausura, for which they will be many people’s favourites. Indeed, not only did they beat the eventual Apertura winners 1-0 away from home and won their first ever trophy against them in the Copa Venezuela final, but also, with just two losses, they were the hardest side to defeat in the league (Trujillanos, Deportivo Lara and Carabobo all lost three). Furthermore, they possessed the meanest defence, conceding 13 goals, whereas their nearest rivals, Trujillanos and Deportivo Anzoátegui, let in 15, a statistic that no doubt pleased goalkeeper, Renny Vega. Capped over 60 times for Venezuela and affectionately remembered for his last-minute assist for Grenddy Perozo’s equaliser against Paraguay at Copa América 2011, Vega announced during the Apertura that he will be retiring in 2015 and so has a strong chance of going out with some silverware. Things could have perhaps been better at the other end as La Guaira possessed only the joint-fifth best scoring record in the league, netting 25 times in 17 games. Argentine forward Imanol Iriberri was their leading light in this area, finishing the campaign with 7 league goals to put him in joint-third position overall. With regards to league goals, he had no rivals on his own side, with his nearest competitors getting just two goals each, although it was a different case in the Copa Venezuela, where the scoring was spread around more and his compatriot Luciano Ursino was actually the club’s top-scorer. Coach González doubtless had some concerns in this area and so, ahead of the Clausura, has brought in not only Edgar Pérez Greco (6 goals for Deportivo Lara) but also Fredys Arrieta, who was in fact the top-scorer in the Copa Venezuela for rivals Trujillanos (more on this in the next section). Thus, with these acquisitions, La Guaira appear to be in rather good health ahead of the upcoming campaign and, come May, will be hoping that they will not be looking back even more ruefully at the game played on the night of 6 December 2014. This was a home clash against Zulia, a side from the oil-rich state of the same name in the nation’s north-west (hence their nickname ‘Los Petroleros‘) who were to end the campaign second-bottom with just 11 points. This was the second-to-last match of the Apertura when La Guaira had recently returned to pole position following a minor blip and were understandably firm favourites to win this game and thus go into their final game in control of their own destiny. Alas, the hosts were to struggle to dominate play, let alone win the game. Zulia took the lead just before the hour-mark when Vega was embarrassingly caught in no-man’s-land, completely missing a cross only for the ball to sail over his flailing arms and be opportunistically nodded in by Johan Arrieche. With 12 minutes left, a very fortuitous penalty was awarded La Guaira’s way, which experienced international midfielder Franklin Lucena slotted home. However, despite the hosts’ increasingly desperate – and, at times, shameful – antics in the remaining minutes, they were unable to find a winner and thus, after Trujillanos gained three points at the death the following day, La Guaira knew that winning their final match would count for little so long as the rivals also did – as proved to be the case. 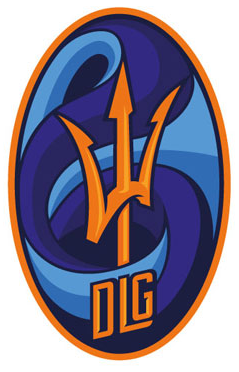 Ultimately, though they had a very disappointing end to the campaign, if La Guaira are able to regroup and deal with their shortcomings rationally, they can look forward to a Torneo Clausura that they will be very strong contenders to win and thus be able put some ghosts to bed against Trujillanos in the Gran Final. So, to the side from Trujillo State – home to a colossal statue of the Virgin Madonna that is even larger than the Statue of Liberty – who supplanted La Guaira at the penultimate stage and sealed the Torneo Apertura on the final day in circumstances no schoolboy dreams about. Given that their meagre budget is believed to be around average in the league, the fact that they were far from runaway winners should not detract from their accomplishment of winning their first ever title. However, unfortunately for Los Guerreros, their lack of financial resources means that they have, in common with most triumphant South American sides, become a victim of their own success with key players having already departed for pastures new. Yet rather than join big sides elsewhere on the continent or in Europe, these individuals have instead signed deals at some of the domestic clubs that, given these losses, Trujillanos now may struggle to effectively challenge in the Clausura. Nevertheless, as could be witnessed in the scenes accompanying their final-day victory, this was a triumph that their fans shall savour irrespective of some the immediate consequences and stands as a testament to what hard work and good organisation can achieve. The man who orchestrated this win is Argentine coach Horacio Matuszyczk who started his playing career as a team-mate of none other than Diego Maradona in one professional season at Boca Juniors in 1981/82. After moving on to Racing and then enjoying a stint in Chile, he saw out his playing career in Venezuela where he retired in the mid-90s and was to re-emerge as a manager over a decade later. He arrived at Trujillanos at the beginning of this Apertura, coming fresh from a respectable spell at Tucanes de Amazonas, a club on the Colombian border with similar resources to his current team, though curiously able to attract larger crowds. 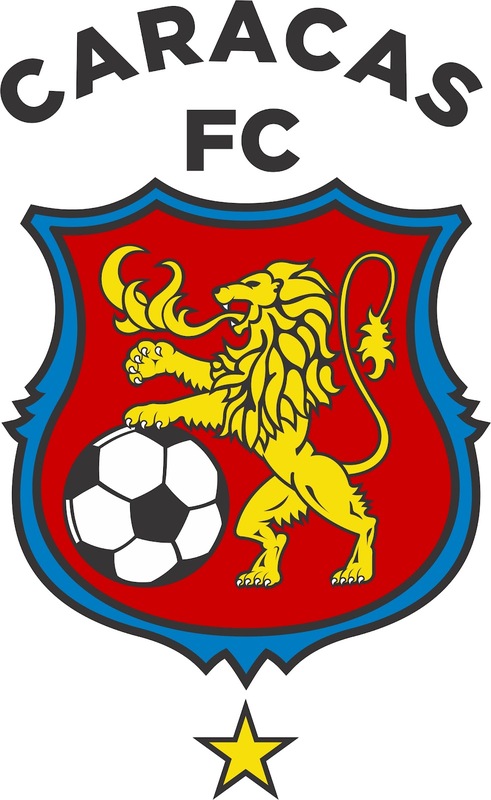 However, unlike González’s La Guaira, Matuszyczk was unable to mount a consistent title challenge from day one as his side’s Copa Sudamericana campaign interfered with their scheduled fixtures. When they got around to playing their second game of the Apertura on 10 September, their opponents were La Guaira themselves, who were contesting their fourth match and won it 1-0 courtesy of a great 25-yard strike from hot prospect Peñaranda. Yet Trujillanos’ early masterplan to seize the title – if indeed they had one; after all, this is a team that had finished no higher than fourth in the previous few years – was thwarted not only by the fixture list but also by their own form. Indeed, in their first six games they picked up a mere 8 points from a possible 18, along the way surrendering a three-goal lead in a home draw with a rather mediocre Atlético Venezuela and following that up with a very poor 4-1 away defeat to Metropolitanos. However, with the advent of October came the real start of their title pursuit as, beginning with a 1-0 win against Mineros de Guayana in their seventh game, they were to go on a phenomenal run until the end of the campaign, gaining 28 points from a possible 33 as well as a place in the Copa Venezuela final. 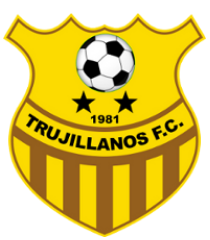 Although Trujillanos, in contrast to high-scoring Caracas FC, never really delivered any emphatic victories – scoring, as they did, no more than three goals in any one game – they did what they needed to and as the positive results continued to be registered, so their confidence increased. It was in fact the 2-1 last-minute victory over Caracas FC during the November international break that put them top of the table for the first time all season, leading Deportivo La Guaira by two points. They had only four games left to play and the momentum appeared to be with them, a feeling they went some way towards cementing after defeating Tucanes 1-0. However, their next game was the home leg of the Copa Venezuela final against La Guaira, which ended 1-1. Whether or not failing to beat their rivals gave rise to internal doubts regarding their credentials as potential champions is impossible to say but they followed this draw up with a 2-0 defeat in the league away to Deportivo Anzoátegui – a loss that La Guaira capitalised on. Indeed, Trujillanos now trailed their rivals by a point with just two games to go and following La Guaira’s Copa triumph on penalties (following another 1-1 draw) in the next game, the writing appeared to be on the wall for Los Guerreros. However, lowly Zulia clearly had not read the script as they managed to hold La Guaira to a 1-1 draw in the penultimate round of fixtures, allowing Trujillanos a reprieve the subsequent day in their home game against Carabobo. If they won this, then going into the final day, their fate would once again be in their own hands. Yet their opponents – draw specialists, with nine, which was the league’s joint-highest – were never going to roll over and so it proved as, entering the final stages, the two sides found themselves level at 1-1. With this score, much excitement was building on social media as it appeared to let not only La Guaira, but also – albeit, to a lesser extent – Caracas FC, back into the title race. However, fans of both of these sides from the capital were to be reeled in for the suckerpunch as Trujillanos, for the second time in a key match, were to grab a stoppage-time winner. This came courtesy of a header following a flick-on from late substitute Irwin Antón, a man who played no more than 45 minutes in this Apertura spread over three games, yet certainly picked his moment to play an integral role in the title victory. Thus, on the last day of Apertura, as has already been relayed in considerable detail, Trujillanos travelled to the capital to seal the deal. They took a 2-0 lead against strugglers Deportivo Petare that they never looked like surrendering and, following some violence and intimidation from local youths which saw the game halted for over forty minutes, the match and, consequently, the title was awarded to Trujillanos. To be sure, this was an exceptional achievement and one that will offer much hope to many other mid-ranking sides with rather average budgets, yet it was also one that Los Guerreros de la Montaña were paying for before the confetti even had time to settle. Within a couple of days there were strong rumours that various players were leaving and before long, deals were announced that tore apart their attacking triumvirate. Indeed, while Sergio Álvarez has so far stayed put, the Colombian duo of Johan Cabezas and Fredys Arrieta have been snapped up by two rival sides. The former, their top-scorer in the league, has become Mineros de Guayana’s chief reinforcement ahead of their Copa Libertadores campaign and the latter, their top-scorer in the Copa Venezuela, in a particularly galling move, has signed for Deportivo La Guaira. Although Trujillanos have a strong recent history with recruiting quality forwards – amongst others, Borussia Dortmund’s Colombian international Adrián Ramos had a successful loan spell here back in 2005 – they may struggle to find adequate replacements for the Torneo Clausura. Their inability to match the wages that can be offered by their rivals clearly hampers them and unfortunately, having also lost experienced defender Édixon Cuevas to Mineros, there is a considerable chance that they may slip, Zamora-esque, down the table in the upcoming campaign. As it seems unlikely that they will triumph again it remains to be seen what condition they will be in when, as is probable, they meet the victors in May’s two-legged play-off between the Apertura and Clausura winners to determine the outright champion. This entry was posted in Venezuelan Domestic Football and tagged Adalberto Peñaranda, Adrián Ramos, Andrés Ponce, Aragua, Argenis Gómez, Atlético Venezuela, Barra Brava, Carabobo, Caracas, Caracas FC, César Farías, Copa Venezuela, Deportivo Anzoátegui, Deportivo La Guaira, Deportivo Lara, Deportivo Petare, Deportivo Táchira, Edwin Aguilar, Estadio Olímpico de la UCV, Estudiantes de Mérida, Federación Venezolana de Fútbol, Football Hooligans, Football Violence, Franklin Lucena, Fredys Arrieta, FVF, Gabriel Cichero, Gelmin Rivas, Grêmio, Imanol Iriberri, Jairzinho, James Cabezas, Jhonder Cádiz, Johan Osorio, Jonathan Copete, Juan Arango, Leomar Pinto, Liga Venezolana, Llaneros de Guanare, Los Guerreros de la Montaña, Mario Kempes, Miguel Mea Vitali, Mineros de Guayana, Monumento a la Paz, Noel Sanvicente, Portuguesa, Rafael Acosta, Rafael Romo, Rómulo Otero, Richard Páez, Rolando Escobar, South American football, Tim Vickery, Torneo Apertura, Torneo Apertura 2014, Trujillanos, Tucanes, Tucanes de Amazonas, Valera, Venezuela, Venezuela Domestic Football, Venezuelan Primera División, Violence, Wilker Ángel, Yohandry Orozco, Zamora, Zulia on December 15, 2014 by hispanospherical. to use and post them on their specialized theme blogs”.